There will be a type of natural stone that can go almost anywhere in the home. The skill is to select the correct stone, as each product has different attributes with its own benefits or disadvantages. With so many different stone tiles on the market, ensuring that the advice given is both correct and supportable is becoming ever more crucial. Every stone tile has its own unique properties and, as such, requires its own specific advice. It is hard to generalise about the stone type and you cannot make assumptions about a stone based on how it is categorised in geological terms. When buying limestone remember it varies greatly in durability. 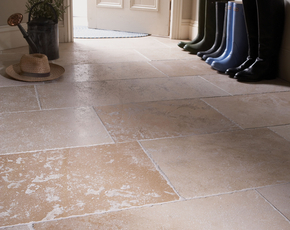 Hard limestone tiles are excellent in intensively used areas - softer limestones best used in low traffic rooms. Not all marbles tiles have the same characteristics, porosity and hardness, so it's hard to compare purely by stone type. For example, we now specify our travertines by density. Low density is the first sign that a travertine tile will develop large holes. Please inform our consultant where you wish to lay the stone so that they can give you the best advice, for example:- inside/outside, in a wet area, in a kitchen or bathroom, as a floor or worktop or laying onto a wooden or concrete substrate, with or without under floor heating. Please also inform our team of your lead time as this may also affect the products that we would recommend. Our consultants will give you advice based on the information you supply. How to select natural stone, tiles and flooring? There is so much choice available that you can find stone for any look from dark textured slate to honey coloured limestone, rough textured flagstones to smooth polished marble. You can lay it in square, diamonds, rectangles; herring bone patterns and random patterns. Stone comes in a huge array of colours and textures. Remember that a stone floor will last a long time - that is one of its advantages - so you need to take your time, consult the experts and choose carefully. It is important that you see a sufficient a range of stone samples showing examples of natural variation, preferably laid on the floor, prior to specifying. Stone is a natural material so expect there to be colour variation - each piece is unique. When you see all those mottled colours they blend together beautifully. If you are planning on using stone in your scheme, then begin by choosing the stone flooring first. It is much easier to match a fabric or paint to a stone than vice versa. After all, the colour of a stone was decided millions of years ago - a new paint colour can be found at the flick of a switch. Do not forget that samples are intended as a guide only; to give a general indication of colour. Tonal colours can vary from batch to batch but when laid in a large area and ‘shuffled’ these subtle variances are the ingredient that gives your natural stone floor character. Natural slate and sandstone are hand riven on the surface and the thickness may vary from tile to tile. This variation in thickness can be taken up in the adhesive bed. All thicknesses and sizes quoted for slate are nominal. This is why we buy the best quality calibrated slate tiles which mean they have a flatter sawn back, are more consistent in thickness and are easier to lay and therefore require less adhesive. We strongly recommend that our Protective Products are used on all our stones when used for interiors, as almost all stone will mark if left unprotected. Please do not leave it to your tiler or builder to provide sealant, adhesives and grouts as we only guarantee our own materials and cannot help you if unknown substances have been put on our tiles. It is also important that if any work such as painting or plastering is to take place after a stone floor has been laid, it is imperative that the floor is covered with ivory board to prevent damage and to save further cleaning. 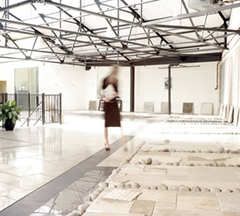 Be it tradition or modern setting, natural stone sets the scene: - clean, classical and welcoming. Easy to clean, tough, durable and uncompromising natural stone flooring can be unassuming to allow change your wall colours to suit your mood without changing the floor. Stone will begin to create a patina from the first day. Unlike manmade materials whose repetitive conformity can look dull and flat, natural stone’s uniqueness and colour variation will be a talking point for years. Please note:- "As stone is a natural material and subject to variations in colour, pattern and texture samples are indicative only. The colour of the sample photograph shown will vary due to the set up of your computer screen and therefore we recommend you see sufficient samples to give you an idea about full range of variation prior to making your specification"